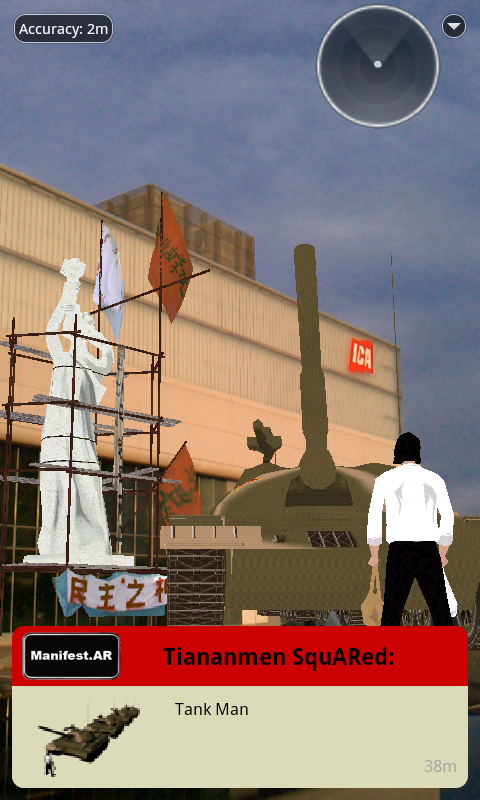 Tiananmen SquARed is a two part augmented reality public art project and memorial by the artists collective 4Gentlemen, dedicated human rights and democracy worldwide. The project includes virtual replicas of the Goddess of Democracy and Tank Man from the 1989 student uprising in Tiananmen Square. 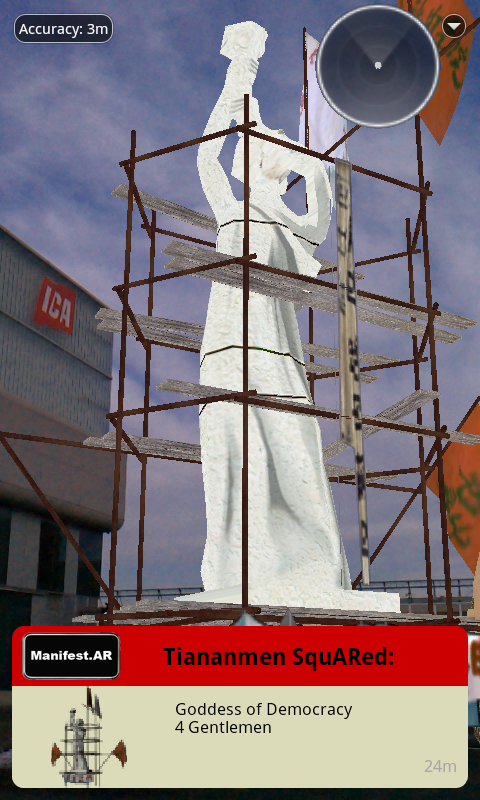 The Goddess of Democracy was a 10-meter-tall statue created by students of the Central Academy of Fine Arts during the Tiananmen Square protest. The statue was constructed in only four days out of foam, papier-mâché and plaster over a metal armature. The students decided to make the statue as large as possible so the government would have to destroy it, an action, which would potentially fuel further criticism of its policies. Tank Man is the nickname of the anonymous man who stood in front of a column of Chinese tanks near Tiananmen Square on Chang’an Avenue the morning after the Chinese military forcibly removed protesters from Tiananmen Square on June 4, 1989. 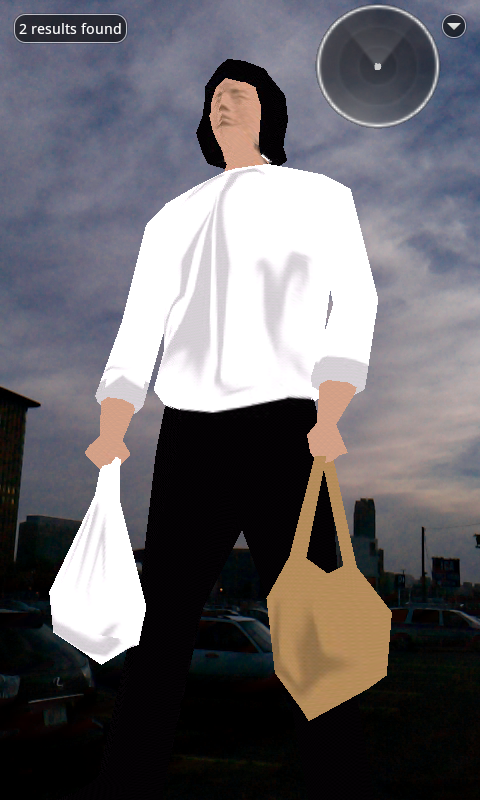 The man achieved widespread international recognition due to the videotape and photographs taken of the incident. Both augmentations are placed in Beijing at the precise GPS coordinates where the original incidents took place as well as at the ICA, Boston. Tiananmen SquARed ICA: Goddess of Democracy and Tank Man, 4 Gentlemen. Tiananmen SquARed ICA: Tank Man, 4 Gentlemen. Tiananmen SquARed ICA: Goddess of Democracy, 4 Gentlemen.